Upper-division undergraduate and graduate-level chemical engineering students; chemical engineers; mid-level management involved in the research and development of waste reduction. 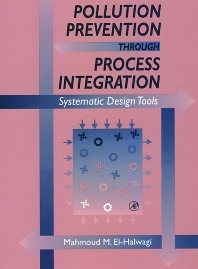 Overview of Pollution Prevention and Process Integration. Modeling of Individual Mass Exchange Units for Environmental Applications. Synthesis of Mass Exchange Networks. Graphical Techniques for Mass Integration: Segregation,Recycle, Interception, and Unit Manipulation. Optimization Techniques for Mass Integration. Synthesis of Reactive Mass Exchange Networks. Combined Heat and Mass Integration. Design of Heat-Induced Separation Networks. Recovery of VOCs. Modeling and Design of Membrane Systems. Environmentally-Benign Chemistry and Species. Subject Index.